Along with many of the indigenous peoples throughout the world, I believe that we are standing at the edge of an extraordinary time in our human evolution. We are building a new world, as the old falls away. The name of these rites comes from the Quechuan word for love, 'Munay'; though this is not the kind of love that we are perhaps more familiar with: the kind of love that we barter for, but instead from the power of the great Love that the Pachamama, Mother Earth, has for us; that Inti Tayta, Father Sun, shines down on us as sunlight. Munay is Unconditional Love. 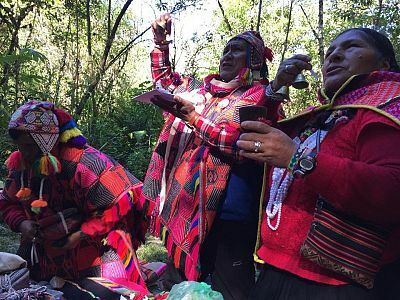 The word 'Ki', though not Quechuan, reflects the power of these rites to heal, and to bring us to greater and greater harmony according to the three power centres of this tradition that are held in the body: Yanchay, the power of Wisdom, which resides in the 6th chakra; Munay, the power of Love, which resides in the heart; and Yan'kay, the power of Service, which resides in the belly. As these 9 rites of the Munay Ki are downloaded into our energy field, they bring with them an ability to help us to transform, and, aided by our own personal healing work, allow us to come into alignment, 'ayni', a living embodiment of these energetic qualities of Wisdom, Love and Service. These powerful initiations from the Inca tradition transmit from person to person the codes of the new human that's evolving right now; they heal our old wounds, change our DNA, and, like new seeds planted in fertile soil, they create an energetic structure that holds a new dream of our world based on love and power working together. A world not informed by the past and who we have been, but one that calls to us from who we are becoming, bringing forth the best of what it means to be a human being. This is the way of the Munay Ki; that as we download these new archetypical energies into our field, we are creating a robust vessel that will hold this new dream on this our planet earth. Consciously co creating a world where we all have a sense of belonging, where we lead lives that have meaning and puirpose and that make a difference in the world and where we live in right relationship with all beings. What will we create? What will this new world be based upon? For thousands of years we have been re-creating an old story... a story of struggle, scarcity, lack, war and conflict; a story of misuse of power and victimhood. Now is the time for the new story of what it means to be a human to emerge and grow into the field of consciousness. It was Einstein who said that we can’t change things at the level at which they were created. 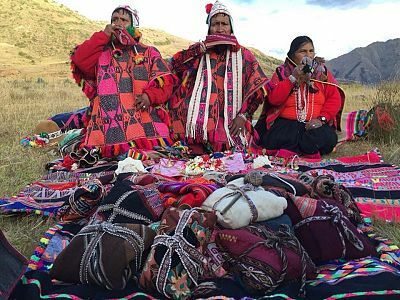 Through the Munay-Ki we are preparing our luminous energy bodies for the great turning, what the Inca tradition called the Pachacutti… when the world turns again the right way up. For the first time in our evolution these rites are being transmitted person to person, we are passing them on - rather like a virus - one that empowers rather than incapacitates, one that is filled with love rather than fear, and one that makes us available for life rather than lifelessness. We agreed to be here at this great time, for the shifts that are taking place right now, we are here to contribute to the great turning, and we are here to answer the call, to step away from the nightmare that is being dreamed for us from a place of scare-city, and wounding; to create a new dream - of equality and abundance, of sharing our resources and caring for the plant that was entrusted to us to safeguard the future for all our children and all those who come after us. You know if you are called to this work; you will be wanting to receive these nine great initiations to others, you will know by the yearning in your soul for something other than that which you are experiencing in the world. You already know deep within you that there is another way to live, another way to participate in creation. During your time with us the shifts and changes that occur in our luminous energy field alone supports our evolution. For we are evolving even between generations, we are becoming homo luminous – the next step on from homo sapiens sapiens (human who knows it all!!) We are evolving into the shining ones, the golden ones, who the Inka call Children of the Sun. Email Chris if you’d like to join us. 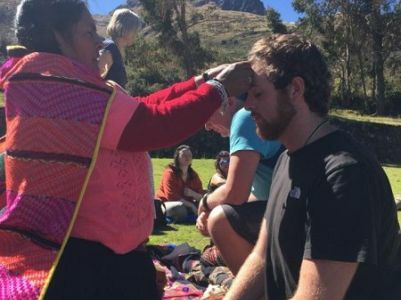 Bringing Love + Power together..
As always, one of the cornerstones of our Peru journey is that we receive the nine rites of the Munay Ki from our Q'ero shaman in the Sacred Valley. Visit the Peru Journey page for full details of our itinerary. 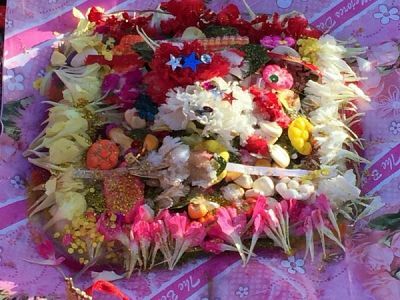 In past years, we have also offered the Munay Ki in Glastonbury, UK. And this year, our shaman will be joining us once again for a Munay Ki class here in the UK. "What a wonderful Munay Ki week in this beautiful landscape of Avalon, which is a brilliant place to do this work. The myths are alive over there and I love that! Thanks again for your excellent and loving guidance through all these feminine and masculine archetypes and principles with its special places in and around Glastonbury.